This beautiful, 160-page book contains lovely artwork and prompts on every page, encouraging your child to dream, draw, write, design and create. 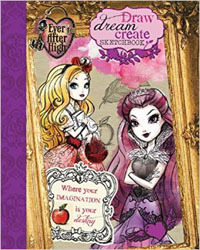 It will take Ever After High fans to the limit of their imagination and develop their creativity. The book looks fantastic with its luxury cover and will take pride of place on your bookshelf.